Let’s face it, kids can be the toughest customers. Passions can run high when it comes to friendships, siblings, even what’s for dinner. To this list we can add the design and decoration of kids’ rooms and spaces for work + play. I suspect that many of us – come on, be honest here – remember wanting to paint our room some unusual color (for me it was yellow!) or wanting to store all our clothing in bags hanging from the ceiling. While kids can be difficult when it comes to design, it’s not their fault and we certainly shouldn’t hold it against them. Expressing contrary opinions, wanting to do things their own way, and experimenting – all of these sometimes maddening tendencies are part and parcel of development. These are part of their job description as developing human beings. One’s room is an important mirror or extension of the self, so it makes sense that growing up can play out as a series of reorganizing and redesign projects. It’s also worth remembering that children, especially young children, are developing and changing so much and so quickly. Just think how different a three- and a one-year old are. Despite the potential difficulties, we do have a few ideas to share about creating spaces that kids will love and use for years. And following this, some fun kids furniture and accessories. Disclaimer: actual children are unpredictable! Give your kid(s) some real choice, but be careful how you set this up. No one likes be be consulted and then feel like their voice has no power in the actual decision making. Maybe you’ll give some choices of paint color or offer free rein and a budget to choose a rug. As much as possible, try to create a space that will be flexible and not become obsolete (or embarrassing) in just a few years. We think it’s generally best to avoid any sort of theme or motif. Your little one might love dinosaurs now, but that interest could fade fast. And with a few exceptions, we suggest avoiding kids’ furniture. It’s usually less well made and comparatively more expensive. If you’ve got a young one he or she might not be able to reach the top dresser drawers, but then again all of his or her everyday clothes will probably fit in just a couple of drawers anyhow. Exceptions to the no kid furniture rule: beds + chairs. Their bodies are smaller, after all. For kids spaces, just as with toys, open-ended is best. Your child can play at being a fairy or a pirate just fine without thematic wall decals. In fact, their play may be better because of the additional imaginative work they’ll need to do. Build a shelf together; paint something relatively small + easy; hang some pictures. Create a budget and work together …. Of course, this will all depend on age + temperament. Below is a picture of the bedroom of the son of my friends John + Stephani. John modified + installed some IKEA shelves and painted the room a simple white with blue above the moulding. Originally the walls were a dark green and it made the space feel dungeon-like and depressing. Their son like the green walls, so it then became an opportunity for John to communicate and share the reasoning behind the design decisions. Thankfully, there was a happy ending and everyone likes the new space. Room by John and Stephani. I think kids need some space that is, as much as possible and within reason, their own. 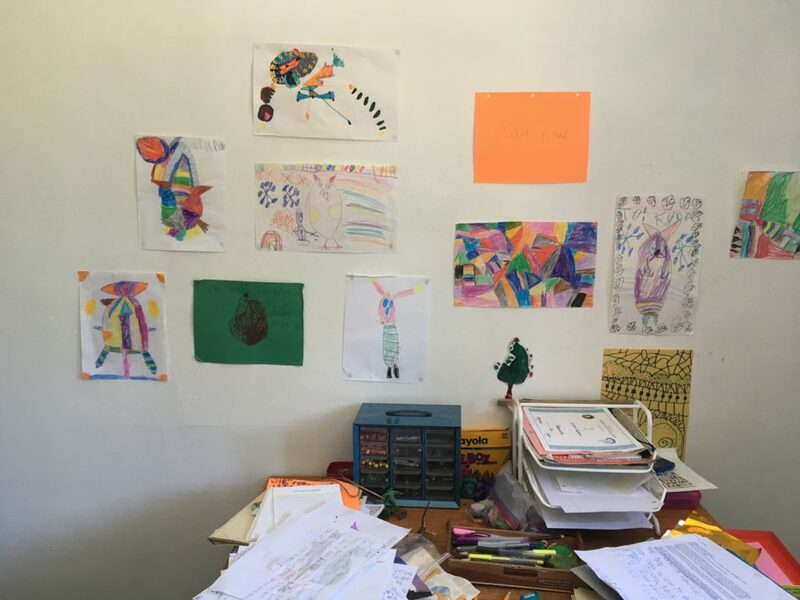 This may mean more clutter, an incoherent color scheme, and a look that is not yours (see the desk of an 8 year old, below). And many kids have nomadic tendencies, wanting to suddenly move their room to the basement or to work in the dining room. There’s lots of great kids products to be found, but here are a few that we like. We gravitate toward relatively simple designs made out of lasting materials that will stand up to use and not be outgrown immediately. For an open-ended pop-up space, Ferm Living’s Mini Dot Tent is great. The Wood Day Bed from Illums Bolighus is streamlined and looks as if it’s ready to take off. Ready, set, dream. 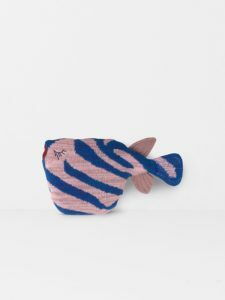 These fish pillows and soft corals from Ferm Living cushion the body and are great for make believe play of all sorts. And parents, they look nice too! The Linea dresser from Illums Bolighus is perfect for stowing little clothes and it won’t fall apart or look out of place as your little ones get less little. Check out those fingerjoint details at the legs! Some kids love getting a bit of height and setting up a cozy spot for reading and sleeping. The Popsicle Mid-High bed from Illums Bolighus is fun and nicely made. Have fun and enjoy watching and supporting your kiddos as they develop their own tastes. Take heart, it is very possible to create spaces that work well for everyone! You can make a perfect cozy spot, have plenty of storage, and still end up with a kids’ room that will look good over the years!